Global equity markets rallied into the last day of the week, with euphoric sessions in Asia and Europe pushing U.S. equity futures through overnight highs and into new all time highs, amid a trader focus on today's quadruple witching and huge S&P rebalancing. 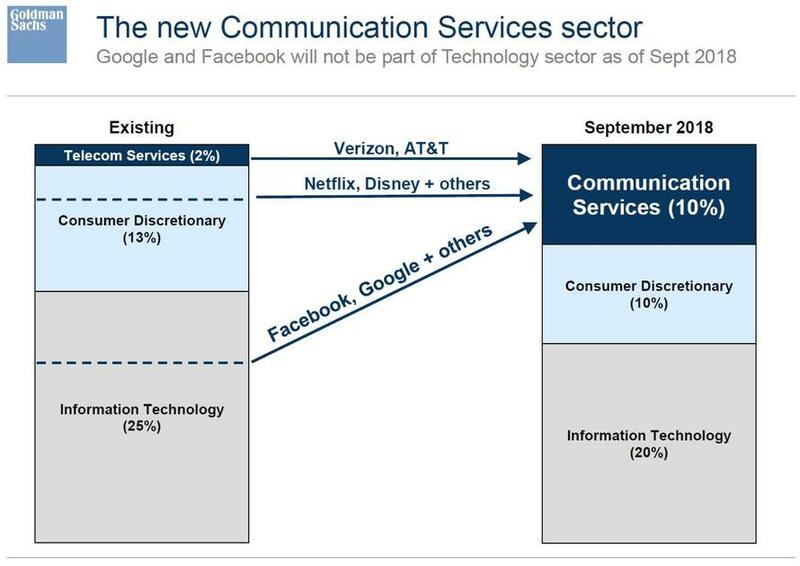 ... on top of the largest revision to the Global Industry Classification Standard since 1999 as Facebook, Google and others exit the Info-Tech sector and move to the newly created Communication Services sector, which replaces the venerable Telecom sector. The MSCI All-Country World Index was poised for a seven-month high after its strongest week since May, as stocks across Asia capped their best two-week rally since February. China's Shanghai Composite soared 2.5% amid receding trade war fears, despite a flimsy start after the PBoC refrained from liquidity operations and dramatically slowed its net liquidity efforts for the week. 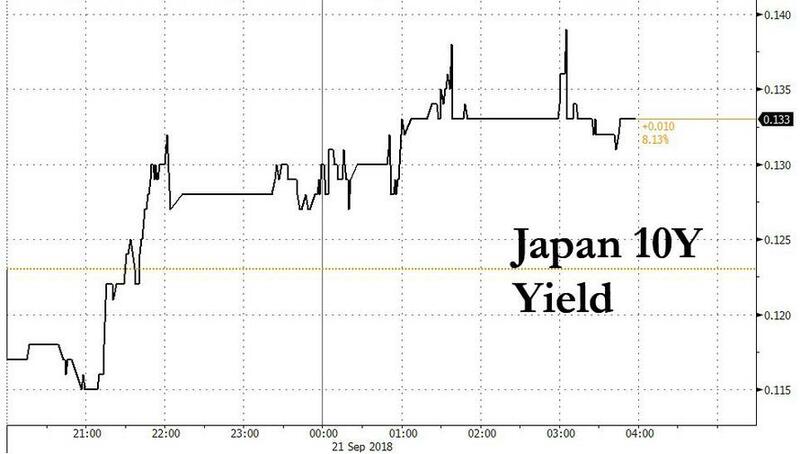 Japan’s Topix Index closed at the highest in four months as the yen continued to slide despite the BOJ's announcement to further taper its bond buys in the 25+ year bucket, which bear steepened the JGB curve, and sent the yield on 10-year JGB bonds up 1.5 bps to 0.13%, the highest level since Aug. 3. Morgan Stanley revised upward its USD/JPY forecast through to mid-2019, citing continued strength in U.S. asset prices and rising bond yields in developed markets. European markets ignored poor PMI data, and were green across the board, as the Stoxx Europe 600 Index headed for its best week in six months rising 2% from last Friday, led by the beaten-down mining and auto sectors, while banks have also been outperformers. Those sectors have been increasingly immune to the global trade noise, which is a hint that investors have started to price in the impact of tariffs and are now seeing upside risks if a trade deal is signed. Europe will see some index rebalancing today as well, as Dassault Systemes will replace Solvay in the CAC40, Wirecard will replace Commerzbank in the DAX, while Linde Tendered, Amadeus IT and Kering will replace Saint-Gobain, E.ON and Deutsche Bank in the Euro Stoxx 50. Still, storm clouds may be gathering because as Bloomberg notes, there have been quite a few profit warnings in Germany since August, including Henkel, Continental, K+S, Zalando, Ceconomy, Suedzucker, Tom Tailor to name a few. Amid the bubbly stock market, further political drama erupted in Europe, with French president Macron branding Brexiteers as “liars” and ongoing fighting inside the Italian coalition government over the next budget. But the noise did not stop the pound and the euro from flying. With the dollar weakening in recent days, the correlation between the Euro Stoxx 50 and the euro reaches its highest level in two years. Even as stocks soared, core European bonds inched higher after the latest PMI data showed euro-area expansion edged lower in September as manufacturing export orders slumped to the weakest in five years, though the euro clung onto gains to head for a three-month high. Europe's September Composite PMI showed misses across the board, with France 53.6 vs 54.6 est; Germany 55.3 vs 55.4 est; Eurozone 54.2 vs 54.5 est; Markit noted the near stagnation of exports dragging manufacturing slower, and despite a buoyant services sector, risks to growth appear tilted to the downside. Italian bonds climbed as Finance Minister Giovanni Tria prepares a draft budget. The greenback whipsawed before edging higher, but remained on course for its worst weekly performance in two months as measured by the Bloomberg Dollar Spot Index. The euro briefly climbed above $1.18 as medium-term accounts closed shorts, while fast-money names took profit on pound longs. US 10Y yields traded north of 3.00%, although so far all attempts to stage a firm break out above the key technical level of 3.10% have been unsuccessful. In Brexit news, former UK Brexit Secretary Davis warned as many as 40 MPs could vote against PM May's Chequers plan but added that Brexiteers are "reasonably terrified" of a Labor general election victory and that Downing Street is "banking on" this fear. UK PM May today will review the fallout of the Salzburg summit with her closest aides with suggestions from a senior minister that she could have to re-write her Chequers Brexit plan. However, BBC’s Kuenssberg tweeted that no announcement is to be made today by PM May, despite suggestions there would be. Meanwhile, over in Italy Deputy PM and Five Star Leader Di Maio said he never wanted to bring down the government and reiterated being committed to keep election promises, while Italy's League said it will govern with Five Star Movement for five years and will respect all the points in the government program. Di Maio later said new pension rules, flat tax and universal income will be part of the 2019 budge. Elsewhere, crude oil headed for a second weekly advance, with Brent and WTI set to end the week positive by over 1% ahead of the OPEC meeting in Algeria this weekend, leading the Bloomberg Commodity Index to its highest level in more than a month. JP Morgan raised its Q4 Brent forecast by $22/bbl to $85/bbl. Elsewhere on Friday, copper climbed to highest level in more than a month as metals extend their surge, with Goldman Sachs predicting raw materials will gain through the year-end as investors become used to trade war tensions and growth in major economies remains strong. Gold still holds strong above $1,200. On today's calendar, expected data include PMIs with no major company scheduled to report earnings. Asian equity markets traded higher as the region took impetus from the rally in US where the Nasdaq outperformed on a rebound in tech, while the S&P 500 and DJIA notched all-time highs. 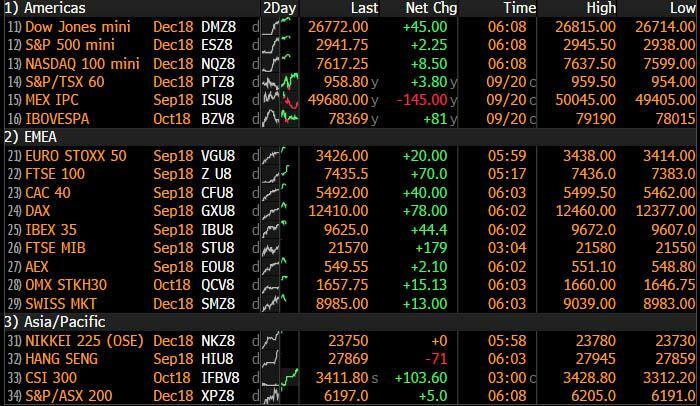 ASX 200 (+0.4%) and Nikkei 225 (+0.8%) were positive with Australia led by strength in miners following the recent upside in the metals complex, while the Japanese benchmark remained underpinned by a weaker currency and approached closer towards this year’s highs. Hang Seng (+1.7%) and Shanghai Comp. 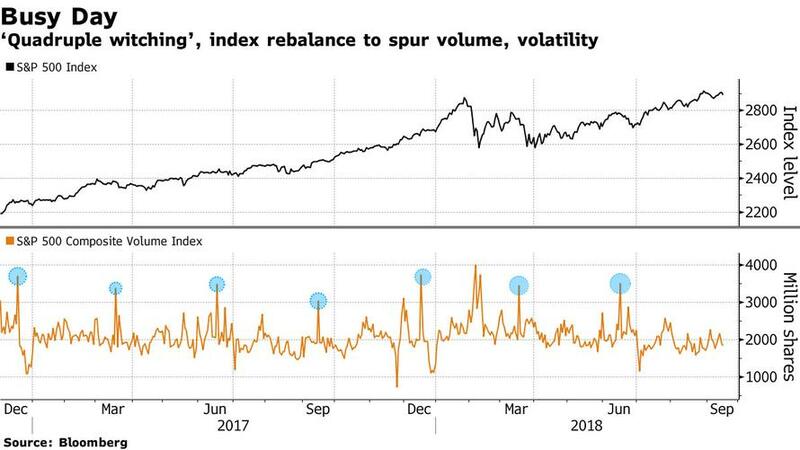 (+2.5%) both conformed to the heightened global risk appetite and markedly outperformed their peers, despite a flimsy start for mainland China after the PBoC refrained from liquidity operations and dramatically slowed its net liquidity efforts for the week. Finally, 10yr JGBs declined amid gains in stocks and after a reduction of the BoJ’s Rinban purchases of 25yr+ JGBs to JPY 50bln from JPY 60bln, which pushed the 20yr yield and 30yr yield to their highest since July 2017 and October 2017 respectively. PBoC skipped open market operations for a net weekly injection of CNY 60bln vs. CNY 330bln net injection last week. Japanese Economy Minister Motegi said they will hold a 2nd round of bilateral trade discussions with US in New York on Monday, while he added he wants a win-win outcome and doesn't expect it to lead to FTA negotiations. Furthermore, Japanese Chief Cabinet Secretary Suga said PM Abe and US President Trump will meet for dinner on September 23rd and will hold a summit on September 26th. European equities have started the day on the front foot, with the Eurostoxx 50+0.8% on the day, and setting the index up for a 2.7% climb this week, as trade concerns continue to ease. The FTSE MIB is todays outperformer, driven by Atlantia, who have reportedly not had the Hochteif-Abertis acquisition next week quashed, despite suggestions it may be delayed by the Italian bridge disaster. Mining names are leading gains in the FTSE 100, with Rio Tinto, Glencore and Anglo American benefitting from higher metals prices. Just Eat are at the foot of the index on competition concerns after source reports suggested Uber is looking to take over Deliveroo. In FX, the Euro extended and widespread gains for the single currency with early tests of 1.1800 vs the Greenback and 0.8925 vs the Pound before weaker than expected Eurozone preliminary PMIs (German manufacturing in particular) stymied the Eur’s advance. CHF/NZD/AUD - All firmer vs the Usd, as the DXY attempts to keep its head above key chart support (93.713 and 93.640) and in touch with the 94.000 handle, with the Franc now eyeing 0.9550, Kiwi hovering just below 0.6700 and Aud re-testing 0.7300 in wake of Moody’s reaffirming NZ’s AAA rating and maintaining a stable outlook after S&P’s upgraded its outlook for Australia overnight. In EM, The Rand continues to outperform or carry the recovery baton across the region after yesterday’s hawkish hold from the SARB, and the Zar is now eyeing the 14.2000 level flagged by the Central Bank vs the Usd with extra momentum derived from SA President Ramaphosa’s economic stimulus plan based on reallocating budget expenditure rather than ramping up spending. Looking at the day ahead, the main focus datawise should be the flash September PMIs in Europe and the US. The consensus expects no great change in the composite level for the Eurozone of 54.5 and likewise the manufacturing component while in the US only very modest increases in the manufacturing and services prints are expected. Away from that the final Q2 GDP revisions are due in France while in the UK August public sector net borrowing data is slated for release. A reminder also that today is quadruple witching day in the US which is when the quarterly expiration of futures and options occurs on the same day – a four days a year phenomenon. It can usually lead to increased volumes and volatility in certain equity markets so something to be aware of. Risk is having a great time at the moment with the main highlight yesterday being another fresh all-time high for the S&P 500 (+0.78%) – the 19thtime this year we’ve closed with a new high but only the 5th since January. The NASDAQ (+0.98%) and DOW (+0.95%) were up even more with the latter also hitting a new high - the first since January.The VIX also hit an intraday low of 11.31 (closed at 11.80) while it was one-way traffic in Europe too with the STOXX 600 rallying +0.70% to notch up a fifth consecutive daily gain - the longest streak since early July. The DAX (+0.88%), CAC (+1.07%), FTSE MIB (+0.51%) and IBEX (+1.03%) also didn’t miss out and as you’ll see shortly it’s been a decent end to the week for Asia too. In early US trading yesterday it looked like we might be talking about new highs for equities and a new YTD high for 10yr Treasury yields after they rose sharply to an intraday high of 3.094% (within two basis points of the May YTD and 7yr high) following a decent slug of US data releases. However, a rally back saw yields eventually pare all of that move to close unchanged at 3.064%. Yields in Europe also ended largely 1-2bps lower. There were no obvious headlines which drove the u-turn for yields but with 10yr Treasury yields up 26bps from the August lows, pullbacks are to be expected. As we discussed yesterday this most recent sell-off in rates has not been accompanied by a sell-off in bond implied vol measures as it was with the selloffs in January/February and in May. I asked our rates strategist Francis Yared last night why vol hasn’t increased this time around and he believed it was because there hadn’t been any major change in inflation expectations as part of the move. It has been as much about removing some of the flight to quality premium that had been in the bond market over the summer due to Italy, Turkey, wider EM woes and the trade war. Indeed, since the recent trough on 25 August, real yields have driven 21bps of the 26bps move in Treasuries; inflation breakevens have moved only 5bps. Inflation remains the glue to stability in financial markets. Growth is strong (especially in the US) but the Fed can be measured, vol can stay relatively contained and risk firm if inflation remains subdued. We still think the risks on inflation are still asymmetric on the upside at the moment though. In terms of activity indicators all eyes next on today’s flash PMIs from around the world. Back to yesterday, the factors which appeared to be contributing to the strong day for risk were a rebound for US tech, decent US data, no further escalation in the trade war, and in fact incrementally positive news from China with Premier Li Keqiang announcing that China would reduce tariffs on non-US imports from the majority of its trading partners, possibly as soon as next month. A weaker USD (-0.66%) and yet another strong day for EM FX (+0.71%) probably didn’t hurt either. As mentioned at the top Asia is finishing the week on a high after taking its lead from Wall Street yesterday. The Nikkei (+1.03%) – which is up for the sixth consecutive session and five of which have seen gains of at least +0.96% - is joined by the Hang Seng (+0.93%), Shanghai Comp (+0.98%) and Kospi (+0.39%) in posting solid gains. Futures in the US are also up while in bonds long end JGBs have seen the biggest move (30y +3.8bps) after the BoJ trimmed purchases of bonds with maturities of more than 25 years by 10bn yen overnight. Meanwhile comments by President Trump on Fox News yesterday in which he said “it’s time to take a stand on China” has seemingly done little to dampen sentiment while the only data out overnight has come in Japan where core and corecore inflation printed in line with expectations at +0.9% yoy and +0.4% yoy respectively. Touching on that US data that we highlighted above, the headline grabber was another new 48-year low (when population was a lot lower) for jobless claims at 201k (vs. 210k expected). Continuing claims also hit the lowest since 1973. Meanwhile the Philly Fed PMI hit 22.9 for September (vs. 18.0 expected) which was an 11pt rise from August. Helping risk (and perhaps stabilising bond yields) was the soft prices component while other components like new orders, shipment and employment all jumped. Later in the day, the August Conference Board Leading Index printed at 0.4%, modestly below expectations but still consistent with third quarter growth above 3% and consistent with our expectations. August home sales were flat mom, suggesting some softness, which is understandable given the 80bps rise in mortgage rates over the last year. In Europe it was more strong data out of the UK which stole the show. Core retail sales printed +0.3% mom compared to expectations for a -0.2% mom decline. Prior month data was also revised up and as a reminder this follows better than expected CPI earlier this week and strong wages data last week. So we’ve seen a strong run of data from the UK of late and the latest has helped Sterling (+0.92% yesterday) to rise back above $1.32 for the first time since July. As for the latest Brexit headlines, the two sides continue to go back and forth with no immediate progress. Nevertheless, press reports suggested that EU officials have picked 17-18 November for another summit, at which they aim to agree on a formal Brexit arrangement before the transition period begins in March next year. Speaking of Brexit, yesterday our UK economists published a special report diving into the impact on the UK economy from a crash Brexit. They calculate that UK growth would be around 4% cumulatively lower than under their baseline scenario by end-2020 with a two-year recession hitting in 2019 and 2020. With a large fiscal response (taken to be GBP 25bn of additional borrowing a year), the loss of output is less severe, with the UK economy growing 0.2% and 0.5% in 2019 and 2020 respectively. The team also make the point that the impact on the EU would be material. They expect the net cost of a crash Brexit to be around 0.5% of EU GDP. This would mean that their base case projection of EU growth (excluding the UK) would fall from 1.7% to 1.1% (y-o-y and rounded). On the flip side our US economists were of the opinion that this time could be different and that Mr Powell could engineer the first ever soft US landing after unemployment has undershot the natural rate. This is especially relevant ahead of next week’s FOMC meeting, when officials will give their first macroeconomic projections for 2021. See here for their full report. In Italy the only new news over the last day was a story about 5SM leader Di Maio threatening to quit the coalition over budget talks if it is not stretched to implement election campaign promises. 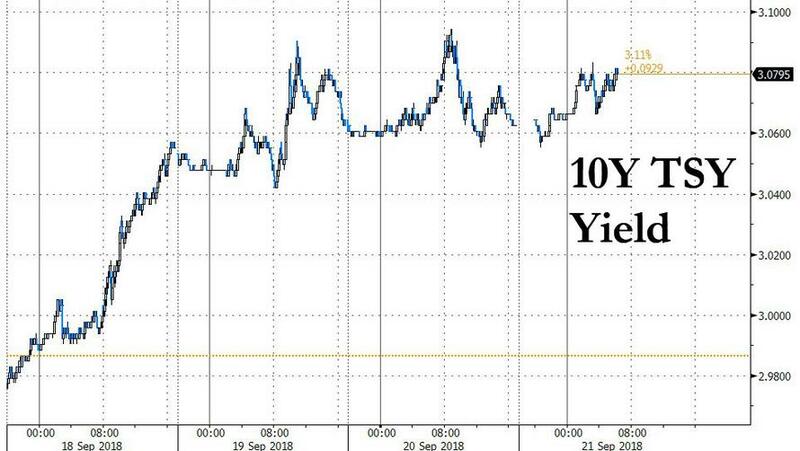 Italian bonds sold off a bit after this, with 10y and 2y yields up 3.0 and 7.7bps, respectively. Before we wrap up, in credit, Michal in my team published a one-pager with charts and commentary called “Credit Fund Flows – Europe Less Weak, US Still Strong” which provides the latest update on fund flows after rather brutal European IG outflows in the previous weekly period and puts them in the context of flows in other asset classes. In terms of the day ahead the main focus datawise should be the flash September PMIs in Europe and the US. The consensus expects no great change in the composite level for the Eurozone of 54.5 and likewise the manufacturing component while in the US only very modest increases in the manufacturing and services prints are expected. Away from that the final Q2 GDP revisions are due in France while in the UK August public sector net borrowing data is slated for release. A reminder also that today is quadruple witching day in the US which is when the quarterly expiration of futures and options occurs on the same day – a four days a year phenomenon. It can usually lead to increased volumes and volatility in certain equity markets so something to be aware of.